Before the birth of modern insecticides, farmers and gardeners used predatory and parasitic wasps and flies, insect-eating birds, lizards and toads as agents of biological control. In the late 19th century sugar cane scientists carried cane toads from Barbados to Puerto Rico, to Hawai'i and then Queensland to control pests. Toads were introduced to some 138 countries, and are now ranked among the world's most invasive species. 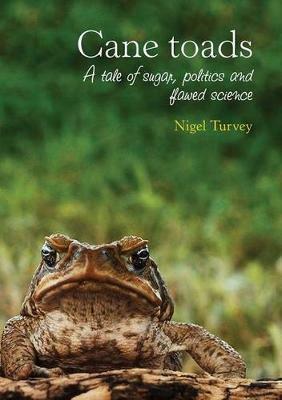 Queensland's sugar scientists released the toad into cane fields in 1935. They were supported by cane growers, politicians, the nation's leading scientists, the premier of Queensland and the prime minister of Australia. Only a lone voice objected. In the following 70 years they spread as far as western NSW and Western Australia. This story is about good intentions, unintended consequences and of simple acts leading to catastrophic outcomes. It is about scientists so committed to solving a problem, serving their country, their leaders and the industry that employed them, that they are blinkered to adverse impacts. There are lessons to learn from the toad's tale. And as the tale shows, we still come perilously close to repeating the mistakes of the past.